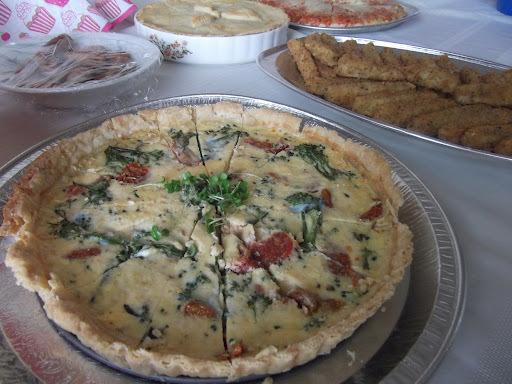 Quiches and tarts are the perfect dishes for sharing at summer parties and picnics. At the beginning of the summer I shared with you my Pesto Picnic Tart, and last summer I posted a recipe for a Low Fat Spinach Quiche, today I present to you Tenderstem Broccoli and Sundried Tomato Quiche. I cooked this recipe for a family party we had last weekend. We don’t often see my Dad’s side of the family even though they’re just a town away, and after a spate of funerals they decided that it wasn’t right that the only family get-togethers had to involve death. (Valid point really…) So, at Christmas my Dad’s cousin hosted the first party and 6 months later it was our turn! We had initially envisaged a Hawaiian themed BBQ, but when the weatherman said that we would be getting a month’s worth of rain in a day we soon had to change the plan. Instead, Mum, Dad and I cooked up a storm creating lots of different buffet/picnic style dishes. Along with my Broccoli and Tomato Quiche, I made individual Cardamom Cupcakes with White Chocolate and Rose Icing and a Lemon and Amaretti Cheesecake. Mum added a Meat Pie to the table, and Dad whipped up a big batch of his Potato Salad and Coleslaw! First you need to prepare the pastry case. Grease an 18inch quiche tin before starting to run the flour and fat together to form breadcrumbs. Once breadcrumbs have formed add cold water one tbsp at a time until the mixture comes together into dough. Make sure you use the least amount of water as possible; you do not want the dough to be sticky! Place the dough into the fridge for 20mins to rest and treat yourself to a cup of tea. Once the pastry has rested, roll it out into a circle until it is large enough to fill the quiche dish and the sides. If there is excess don’t worry about trimming it yet. Prick the base of the quiche with a fork before placing grease proof paper over the top, covering with baking beads (or dry lentils/pulses) and blind baking for roughly 20mins or until golden at gas mark 4. Halfway through the blind bake, you can begin preparing the filling. Blanch the broccoli for 5-10mins until tender. Next whisk together the egg and cream before stirring in the parmesan. Before filling, trim the cooked case with a sharp knife. Next, spread the broccoli and sundried tomatoes evenly across the base of the quiche before pouring over the egg mix. Finally, bake the quiche at gas mark 5 for 15-20mins or until the egg has cooked through. There are a number of ways you can make this Tenderstem Broccoli and Sundried Tomato Quiche a little bit healthier, use skimmed milk instead of cream in the egg filling, maybe even just using egg whites! It will taste less rich but won’t be so cruel on the hips. 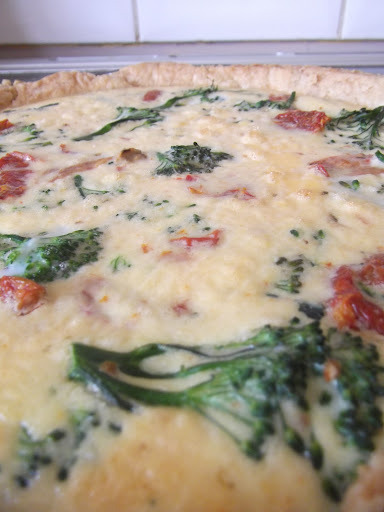 Guests love this quiche because its full of flavour annd light on the old waistline.